In March and April, Tereza Ondrová and Veronika Knytlová will be guest choreographers at the Vorpommern Theatre in Greifswald, Germany. During that time, the Atelier of Creative Motion will be led by Robert Janč. The Atelier of Creative Motion has a spring break from March 2 – 6, 2009. In March and April Tereza Ondrová and Veronika Knytlová will be guest choreographers at the Vorpommern Theatre in Greifswald, Germany. The Atelier of Creative Motion will work closely with Robert Janč, who danced with Veronika Knytlova in the latest show of the VerTeDance Company, Jaja and Papus. The dancer and performer Robert Janč (1978) originally studied English and Czech language teaching at the University of Hradec Králové. He completed his studies in 2002, but already in 1999 had embarked on a theatre career. He first worked together with the Teatr Novogo Fronta in Vagabond Adam Kadmn (2000), Petrouchka (2001) and Dias de las Noches (2002). The last of these performances was awarded at the Edinburgh Fronte Festival with a Fringe First prize. In 2006 he graduated from the Department of Non-verbal Theatre at HAMU. In 2007 he joined the motion theatre group Krepsko and participated in the highly regarded projects Errorism and Twilogy. In 2006-2009 he also worked in technical production in the group Farma v jeskyni. 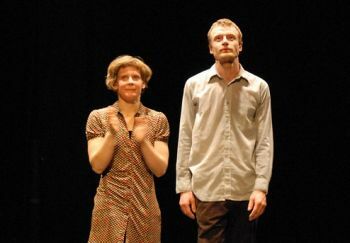 Robert Janč’s latest and highly successful stage project was the performance of Jaja and Papus by VerTeDance, which premiered in December 2008. During his time at the Atelier of Creative Motion, Robert Janč will use the same methods of work which you are already accustomed to with Veronika and Tereza. Upon their return in May and June, Veronika and Tereza will judge your results and will once again lead the Atelier. We wish you a lovely spring dancing with Robert! The Atelier of Creative Motion has a spring break from March 2 – 6, 2009.